Like many of us, I could spend hours perusing cookbooks, always on the hunt for something new and intriguing to try my hand at. So when I saw this recipe in “Green & Black’s Chocolate Recipes”, by Caroline Jeremy, I did a double-take! What the heck? Chilis filled with chocolate and then dipped in chocolate? Oh, and the best part? The chilis are marinated in vodka! Well, I just knew that I had to make them for a special occasion; and what better holiday, than Valentine’s Day. I will tell you that this recipe has that “wow” factor. If you really want to impress your sweetheart, whip up a batch of these! I learned a few things as I made these chocolates, and I am happy to share that info with you today. First, the hardest part of this recipe is getting the seeds and membranes out of the chilis without cracking them open. I used the scoop-end of a small seafood fork to accomplish this task. Just be patient and they will all come out eventually. Try using larger chilis. I used smaller ones on my first attempt, and they were much more time consuming! Secondly, if you don’t want to get your valentine too tipsy, don’t marinate the chilis for much longer than the recommended time. I placed my chilis in the vodka and then got busy, so they marinated for several days before I got to fill them! Phew, one bite and I was feeling it, and the flavour of raw alcohol was very strong. If you and your valentine don’t ingest alcohol, just leave it out altogether. Thirdly, if you don’t like really hot chilis, it is possible to remove some of the heat by blanching the de-seeded chilis or by boiling them for 2 minutes. I just learned this trick and it works really well. Next, this recipe is so flexible. You can change the flavour altogether by using a flavoured chocolate to fill or dip the chilis. Also, you don’t have to use vodka. Try some tequila or a liqueur that you like. And lastly, don’t throw away the vodka marinade! You can use this to make a wicked, chili martini or another cocktail that calls for a bit of kick! I am excited to be bringing a big batch of my chocolate filled chilils over to the gang at Fiesta Friday! I know that many of them love chocolate, so I think these will be super popular! Come join us! Angie, of The Novice Gardener, hosts our virtual blog party every Friday. Happy Valentine’s Day everyone! This treat has that “WOW” factor! Place the chilis in a medium glass bowl and cover with the vodka. Cover with plastic wrap and allow to marinate for at least 12 hours. To make the filling, melt the white chocolate in the top of a double boiler. Place the melted chocolate in a pastry bag, fitted with a small nozzle. Remove the chilis from the vodka and shake gently to remove the excess vodka. Fill each of the chilis with the white chocolate and gently place on the prepared baking sheet. Pop the baking sheet into the freezer until ready to serve. Sift the confectioner’s sugar over your serving plate and top with a couple of good grinds of fresh black pepper. Melt the dark chocolate in the same manner as the white and pour into a glass jar. Remove the filled chils from the freezer. 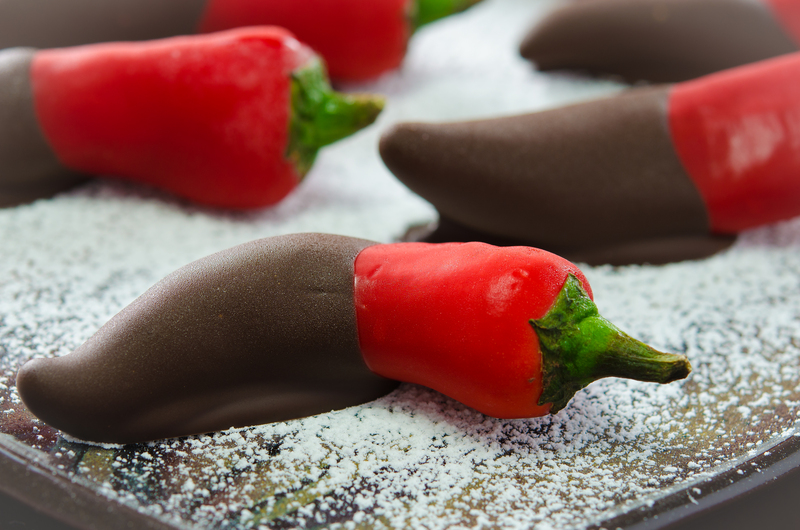 Dip each of the chilis into the dark chocolate and place them directly onto the serving platter to set before serving. Do this 1/2 hour or so before serving to allow the chills to thaw and the exterior chocolate to set. I used a seafood fork to remove the seeds and membranes from the chilis. It is possible to blanch the de-seeded chilis to soften their flavor, or boil them for 2 minutes to remove most of their heat. I tried this and it works really well. You don’t have to use vodka. Try some tequila for a little more kick. Or the next time I make these, I will try marinating the chilis in some White Chocolate Liqueur. This is such an interesting recipe! 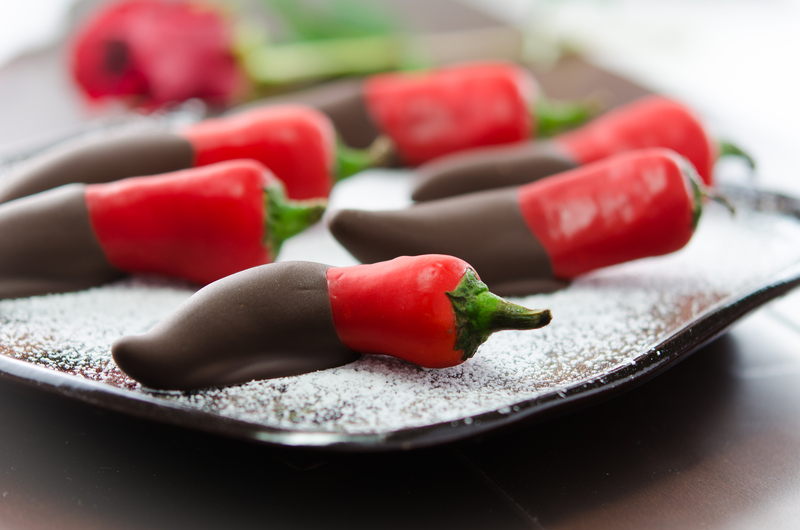 Love the combination of chillies and chocolate! This is such a gorgeous idea. I wonder if i could substitute vodka with something. Sure! If you don’t want the alcohol, just leave it out, but you could use tequila or I was dreaming of a white chocolate liqueur! This gets the vote for most original V day treat! Loved your idea of tequila infusing Happy to learn you can blanch some of the heat out of peppers. Great post and the chilis look fantastic! Thanks Johanne! I was super happy to learn about the blanching trick! My husband doesn’t like his food as hot as I do. Now I can keep the chiles in the food, but just cut down the heat! omg Julianna these are ‘out of the world’ gorgeous and smoldering ‘hot’ Valentine’s day treats! Oh boy! what a combination of ingredients – vodka, hot chili and chocolate! Ooh la la! Cant stop looking at the pictures! this is one wicked Valentine’s treat! Happy Valentine’s day to you! Great find … now if they were only wrapped in bacon! I’ve made chili chocolate before, but the addition of vodka is a new and very welcome one for me. This looks like maybe my favourite way to eat chocolate. Oh, I bet you will put some completely amazing spin on this recipe when you do make it, Hilda! Let me know what you come up with! It is so flexible! Chef Julianna this recipe is incredible! 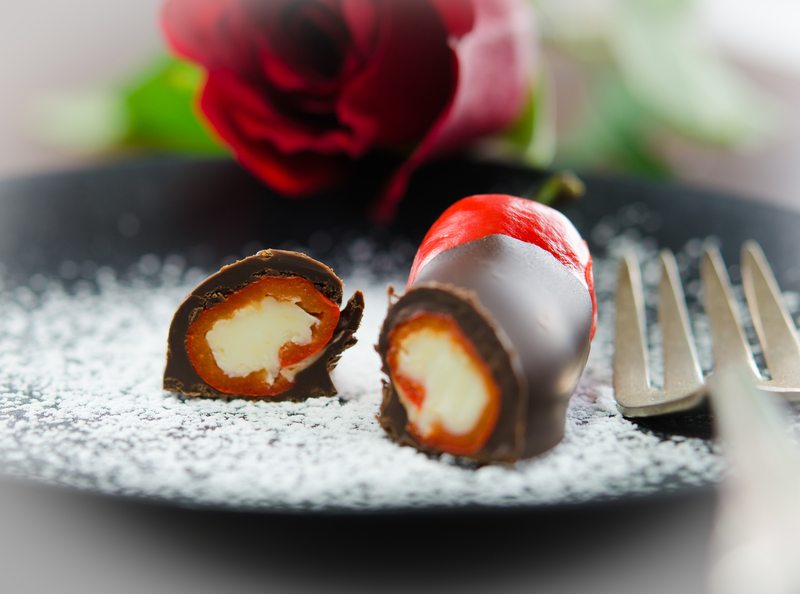 You would deserve the cover of a food magazine with this S.Valentine recipe! These are so creative Julianna! And they look so fancy! Would be so great to do when you are having a group of people over! I was thinking the same thing, Lori! Amazing – just amazing and I love the idea of a chilli flavoured martini too. Such a brilliant idea and perfect execution too! Happy Fiesta Friday! Oh thanks, Selma! No need to waste perfectly good vodka, is there? 🙂 Happy Fiesta to you too! Hey Dini! Let me know when you have made them! Oh, and I made my first batch with red and green chiles…so if you can’t find the red ones, just use green! Thanks Loretta. I was so excited when I found this recipe! I dreamed about if for a long time before I actually made them. Wow! Thanks so much, Naina! I wish I could just pass the plate to you through my computer screen! Wouldn’t that be awesome? Now that is a chocolate and a half! Wow, they look amazing! Absolutely deliciously decandent perfect share!! Loves the idea and the recipe. Oh my Julianna, this is quite a recipe and I love every bit of it. I vote for the white chocolate liqueur. OMG how unique! I can’t wait to serve these at my next party. They will definitely be a surprise! Let me know how they go over!! Julianna, I just love this! I’ve never seen chocolate covered chilis but here they are! And gorgeous! Thank you for bringing these boozy little guys this week! So happy to do that! They seem to have been a bit of a hit! I’m always just happy when the photos turn out, and I do like these ones here. Haha, wow, amazing idea!! Love how creative this is. Who needs strawberries dipped in chocolate when you can have chilis? 🙂 Would love to try! They look amazing – my chilli-loving boyfriend would love them! Yes, amazing indeed! I love chocolate with an added “kick” these certainly would qualify. I’m not a fan of vodka though so that part, doesn’t particularly appeal. Love your photos Julianna!!! I enjoyed reading your post. I can’t remember when I last saw a bottle of Vodka around here. I might try dunking mine in port or sherry. The photos look really awesome and am so curious. What did it taste like? sweet and alco-hot? This is quite impressive! I am dying to try them! So curious what is the taste. Such an amazing, out of the box recipe. Beautiful photos 🙂 Thanks for sharing it! I have 15 Little chili plants in my kitchen window that will hopefully burst with fruites later this Summer, so I’ll save this recipe ’til then. Thanks for sharing! Oh My! This is exciting stuff! Oh hubby’s gonna love this one! !